Thanksgiving goes back in time far beyond the Pilgrims. From early religious scripture to ancient philosophy, giving thanks and finding contentment in life has been a significant aspect of human history for thousands of years. So, for this Thanksgiving, and perhaps for many more to come, take a broader view of what it means to be thankful and try to remain that way throughout the year. No matter how you give thanks, whether it is through prayer, meditation, or general practice in keeping a positive perspective, you can use guidance from wisdom that stretches across millennia. This strikes at the heart of the American celebration that is Thanksgiving. Just being thankful for our blessings and that there is food on the table on any day, not just Thanksgiving, will keep you rooted in a healthy perspective and serve as a reminder of those people less fortunate than you. Many of the most important ancient Greek philosophers in history believed that contentment is the foundation of living a happy and healthy life. In fact, their word for happiness, eudaemonia, has a meaning that most resembles human flourishing, and certainly not anything that resembles fleeting pleasure. So, happiness to the ancient Greeks was more of a trait than a state. Although Socrates (470 BC—399 BC) didn’t write down any of his teachings, he is attributed through his famous student Plato, as saying, “Contentment is natural wealth; luxury is artificial poverty.” One could translate this to mean that those who are thankful for having only what they need are already rich in the sense of fulfillment and true happiness, whereas the financially wealthy, in his experience, were rarely satisfied with what they had. This quote differentiates needs from wants; the contented person is satisfied with meeting his or her needs and thus has no wants. This contentment keeps one rooted in the present, where life is happening, rather than wishing for a better future. This quote from Lau Tzu describes what many of us think about during our Thanksgiving celebration. Being thankful for our food, health, family, friends, and the roof over our heads is a reminder that, when we have these things, we are truly rich in the healthiest sense of the term. This quote from Confucius is a bit abstract, but if we dig deep enough, we find that concerning ourselves with ideas and concepts of happiness may paradoxically lead away from our happiness. Forget about it and just be happy! Also, external things should not make us happy or sad. Contentment lies within. If you are familiar with Thoreau’s writing and philosophy, you might not be surprised that he was perfectly content living in a small, rustic cabin in the woods, where he wrote his famous book, Walden. Don’t just be thankful for the big things that come to you in life; be grateful for everything that brought you to where you are now. 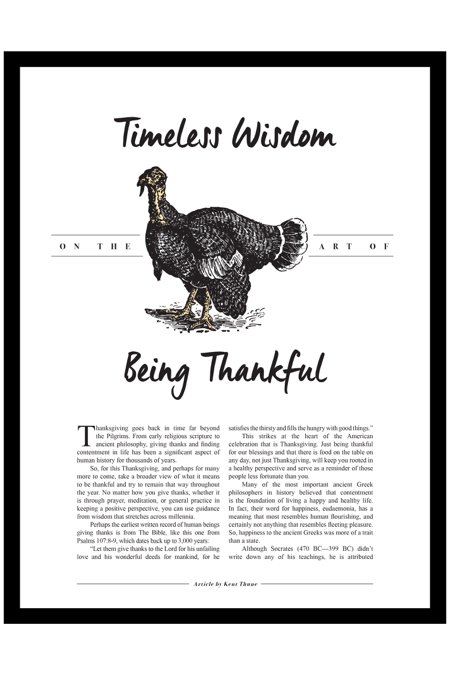 Of course, it would be difficult to rattle off every single event in your life that deserves thanks, but Emerson suggests giving thanks continuously, which can be formed as a habit and practiced throughout the year, not just on a holiday. In reflection of all these quotes from thousands of years of wisdom, one can draw from them an underlying theme that lies deeper than that of thanksgiving and contentment. The fact that these ideas and philosophies have been practiced for millennia, across a range of religions and philosophies in all parts of the world, demonstrates how central they are to the well-being of all human beings. Yes, eating food and having drinks with friends and family can be part of a wonderful holiday celebration, but don’t forget how fortunate you are to celebrate these things in the first place! Most important, Thanksgiving is a time to be happy but in the truest sense of the word, which is to be content with what you have now. Happy Thanksgiving! Kent Thune is thankful for his wife, Angie Thune, his two sons, and for his and their health. Everything else is extra. Thune is the owner of a Hilton Head Island investment advisory firm, Atlantic Capital Investments, and is personal financial counselor to service members on Parris Island. You can follow his musings on mind, money and mastery of life at TheFinancialPhilosopher.com or on Twitter @ThinkersQuill. Vying for Tying the Knot On HHI - Get Hitched on Hilton Head Introduces Three Semi-Finalist Couples!